Who doesn’t love chocolate? Here are delicious sweet and savory chocolate recipes, along with the fascinating story of how North America's first organic and Fair Trade chocolate factory came to be (and why they are so passionate about how their chocolate is made). Theo Chocolate is dedicated to making the world a better place. From bean to bar, Theo Chocolate uses organic ingredients and is committed to Fair Trade practices, working closely with farmers around the world who grow the cocoa beans used in their chocolate. This book not only shares Theo's story and their passion for doing the right thing, but also celebrates the decadent pleasure of enjoying excellent chocolate thanks to 75 recipes to make at home along with full-color photographs throughout. Since he founded the company, Joe Whinney has dedicated his passion for chocolate, sustainability, and economic justice to the mission of Theo Chocolate, the first bean-to-bar maker of organic, Fair Trade, fair for life, and non-GMO-certified chocolate in North America. Debra Music took a 3,000-mile leap of faith and moved to Seattle from the northeast to assist in the launch of Theo Chocolate. Since then, she's helped Theo become one of the fastest growing brands in its category by using authentic storytelling to demonstrate the intersection of artisan chocolate making and sustainable, ethical business practices. "Debra may have written the book in a mere 9 months, but Theo reflects many years of recipe imagination and experimentation. If you try the recipes in this book, you will be pleased and surprised. Your only dilemma is where to start." "If there’s one cookbook that every self-respecting Seattleite should have in their kitchen, it’s the new book from Theo Chocolate, the award-winning, bean-to-bar chocolate maker and all round Seattle treasure." "This cookbook serves as both a prize for chocolate-lovers and a window into what motivates Theo from bean to bar. The cookbook isn't just full of chocolaty sweets, chocolate is bitter and its subtle sweetness brings depth to savory recipes. But the last section of the cookbook is for the truest chocolate-lover and offers redemption for my past chocolate failures — confections. They even have a cheat for couverture that doesn't require all that finicky tempering. [A] great gift to give to a chocolate-loving friend or loved one." "This is a cookbook for the serious chocoholic. Packed with mouthwatering color photos, tidbits about the origin of each recipe and helpful technique tips, Theo Chocolate is a love letter to the humble cocoa bean and a tribute to the authors' work together." "Theo Chocolate is a rare breed: dedication, deliciousness, and daring have met and the results are spectacular! This is essentially a guide book to the nuances of the luxurious cacao and its ability to grace your table from appetizers to dessert." "This is a must-have book. Theo Chocolate's vision to pioneer an organically sourced bean-to-bar program is now a part of chocolate history. Not only is the company a shining example of sustainability, the quality of the chocolate they use is incredible--it is carefully sourced and the flavors are super pure. And now Theo is honoring us with the ability to recreate their wonders at home." “I am a big fan of Theo chocolate. This company is setting the standards for sustainability in a world that desperately needs ethical agriculture. Every ounce of chocolate they make is guaranteed organic. Just as important, the company works to improve the health and well being of all those who are affected by the operation, including the animals and the environment. And this enchanting cookbook is evidence of Theo’s other important mission--gratifying all of us chocolate lovers with ever more exquisitely delicious delights." "A reason to try your hand at homemade candy bars"
"The book’s 75 recipes branch out from sweet confections, and move into savory territory." "[The book] is, yes, a book for chocolate lovers. But the story within is one that reaches into the mysteries of human nature, the politics of agriculture and trade, and the secrets behind a good piece of chocolate." "Chocolate, it’s not just for dessert anymore...In these recipes, dark chocolate shows off its savory side, offering richness and complexity to sauces, chili, veggies, and pasta." "Chockfull of cocoa-filled recipes, ranging from granola to pie, Theo Chocolate: Recipes and Sweet Secrets from Seattle’s Favorite Chocolate Maker is truly a chocoholic’s dream." "The inspiring story of Seattle’s fair-trade chocolate company, accompanied by sweet recipes as well as a broad selection of savory ones." "Give a person chocolates, you feed them for a day; gift a person Theo Chocolate’s cookbook, they’ll ride that sugar high for a lifetime." "You will not find such creative and delightful chocolate recipes anywhere else." "Focuses on decadent treats perfect for this time of year." "Theo Chocolate and their gorgeous cookbook by the same name just might make you rethink getting that restaurant reservation for February 14th." "This collection of 75 recipes is sure to take that chocolate love to a whole new level. " 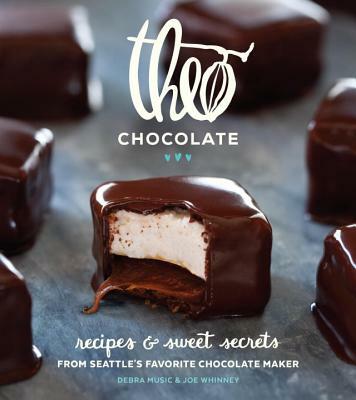 "Theo Chocolate: Recipes & Sweet Secrets from Seattle’s Favorite Chocolate Maker is much more than a how-to. The book helps to deepen one’s relationship with chocolate (we didn’t even think that was possible)." "The book brims with recipes sweet and savory, beginner and advanced, standard (brownies) and not-standard (agrodolce brittle: chocolate with capers), capturing the open-armed, community-inspired ethos that drives the company." "Celebrated bean-to-bar chocolatiers Music and Whinney channel their passion for chocolate into innovative, cacao-focused recipes."